Imagine that you and your family are going to move to a house in an area you love so much. Imagine that the house you are going to move into was entirely designed by you. When men are considering moving to a new house, their biggest concern is the necessity to mow lawns every day. But the thing that worries women is how to set their closets up. You may go through numerous ideas about the shelving systems, but none of them will seem suitable for you. But hopefully all this will change with the appearance on the new open source 3D printable design called Moidules. 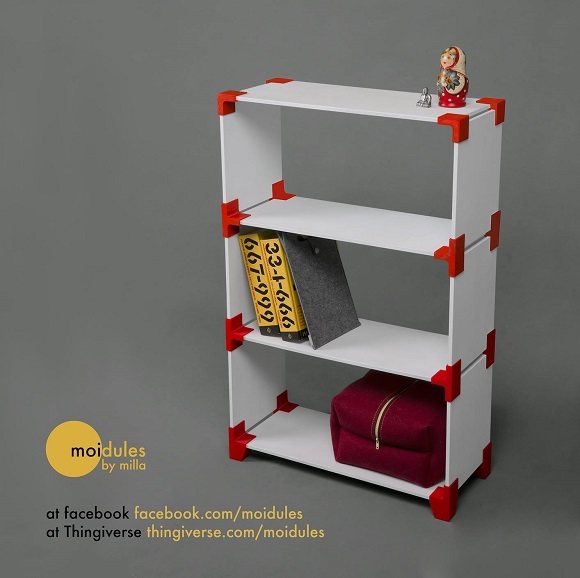 Moidules is the invention by Milla Niskakoski – a Finnish design student who is now working in Seol, South Korea, and trying to get a master’s degree in product design. She has probably also experienced all the worries and frights of having to manage shelves in the bedroom, or garage, or closet or wherever that needs custom storage. Milla tells that she has always been a hands-on person in design and she likes DIY and creating stuff. She thinks that if she can make it with her hands, there is no need for her to buy it. That is the reason for many of her things to originate from her personal needs for something. That’s the same with the Moidules project. She lives in a small apartment in the centre of Seol and she wanted to make it as functional as possible and more organized. In particular she needed a very custom shelf to use the space between the fridge and the sink. Of course she could have used some MDF pieces together, but her intention was to make it more original. That’s how the idea of 3D printable moidules appeared. 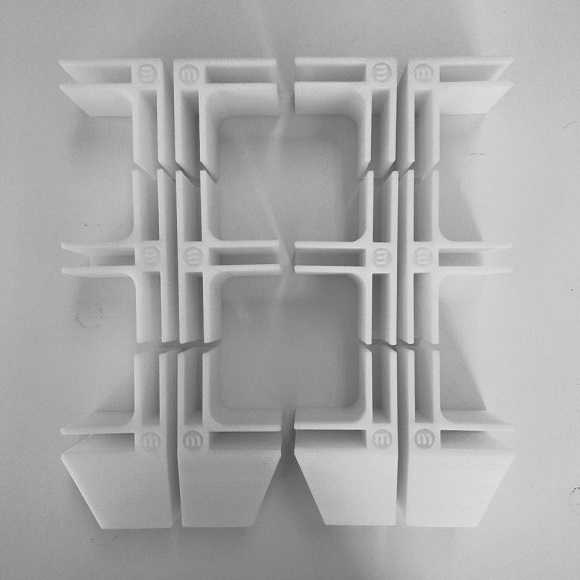 The original idea was to create custom modular 3D printed shelving. But the most difficult part was designing each element. Luckily for her Milla has been acquainted with 3D printing since she was a graduate student. She began with printing the first Moidules, and the altered a bit its dynamics. Having tried a number of designs and prototypes, Milla found the most suitable size, with which she preferred to work. 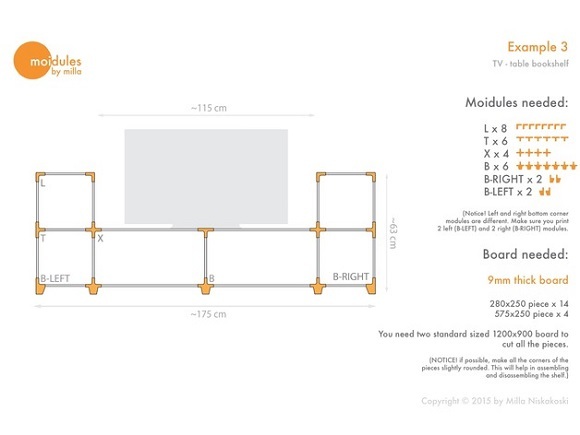 In fact, you will notice that the Moidules are rather large in comparison with other shelving modules available on the market. And there are some reasons for it. First of all, as there is more surface clasp the boards, you don’t have to use any screws or glue to make the shelf more robust. Secondly, Niskakoski wanted to show the 3D printed parts and not to hide them. 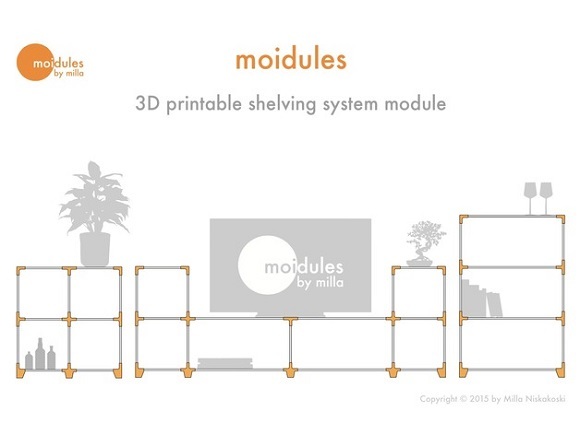 It’s interesting to have a 3D printed bookshelf, and Milla also wanted to make the visuals of her system the limelight. 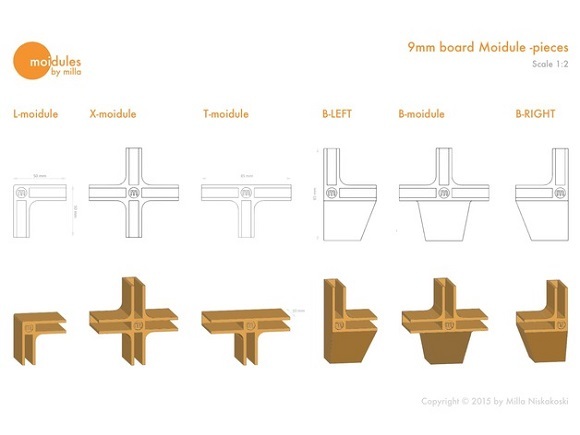 Niskakoski has already produced six different Moidules, which can download for free from Thingiverse. Among them you will see 3 different leg pieces, a middle piece, a side piece and a corner piece. So if you have access to 3D printers or have your own 3D printer, you can create shelving according to your exact requirements. The creator herself compares her shelving to LEGOs. Probably it’s a bright comparison. She designed them hoping to reduce the amount of manufacturing process required to reduce typical shelving that you can see at the stores. Modular shelving systems are not new to the market, and Niskakoski doesn’t say that her Moidules is a completely new design. What is new about it and what she emphasizes is the way the customers get them. A custom bookshelf is first of all sketched by a designer, then produced at a factory and then sent to the distribution centre. Then it gets to the store, which can be anywhere in the world. Finally the user buys it and has it delivered to his place. You may not even know, but your bookshelf may have traveled around the globe before it appeared in your room. Such a process expends a lot of natural resources. 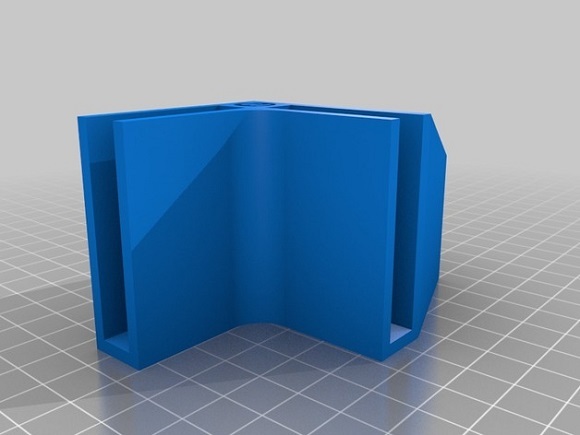 Using a 3D printer will allow you to get your bookshelf immediately from the designer to the customer. That’s what she considers groundbreaking and hopes it will become the future of the consumer relationships. You don’t need glue or screws to assemble Moidules, so the assembly disassembly a piece of cake. They go well with small and medium-sized objects, can be used with any typical material for shelving. If you work with tall bookcases, it’s better to add an X-shaped supportive structure at the back of the shelf to make it more steadfast. Niskakoski says that when she has more time, she will continue developing the Moidules. But she also expects to see other innovative structures based on her design so that she could advance her system. She confessed that she found her Moidules too good to keep it for herself only, that’s why she shared them with the public. She did her best to make it more attractive and special. 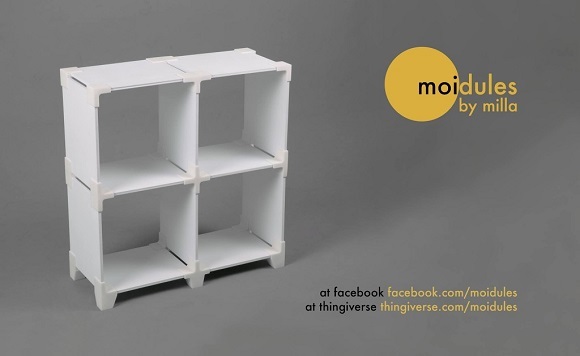 Her dream is to see pictures of Moidules shelving from all over the world, in various designs and colors. She hopes that other designers will get interested and create accessories and other types of such shelves and her project will start living its own life. So if you’re considering moving to a new house, you should definitely think of getting such shelves for your wife or for yourself. Can You Get Better by Taking 3D Printed Meds?